By then, the company had already ended agreements with SpaceX and Orbital Sciences Corporation (now Orbital ATK) to build the booster. In fact, Vulcan had ended its agreement with Orbital about a year previously, and it had not announced a replacement booster. Beames denied they had made a mistake with Microsoft Founder Paul Allen’s latest space project. He also said they had identified a new launcher and would be announcing it in the fall. This morning, Andy Pasztor of The Wall Street Journal quotes Beames as saying the program is being re-evaluated. Chuck Beames, president of closely held Vulcan Aerospace and one of Mr. Allen’s top lieutenants, said the entire project is being reassessed to determine “what’s the best way forward,” though he declined to provide any details. Calling it “an unprecedented undertaking,” Mr. Beames said the high-risk in initiative “takes time to develop and our intention is to be thorough in all our processes.” He said the project hasn’t been shelved, adding that Mr. Allen remains committed to transforming space transportation by serving a wide range of customers and starting service before the end of the decade. But “we’re not prepared to announce or comment publicly [about] timelines,” Mr. Beames said…. A number of aerospace industry officials familiar with the project have raised doubts about its direction. Smaller, lighter satellites don’t need such a large, complex system to get into low-earth orbit, they said, pointing to less expensive alternatives such as hitching a ride on existing rockets that blast off from traditional launchpads to hoist big payloads into high-earth orbit. Stratolaunch has always been a somewhat mysterious project. Skeptics have questions how competitive it would be with launch vehicles of a similar class. There has been a lot of speculation that the system was being developed primarily to loft military satellites because of its ability to launch payloads to any orbital inclination. The story states that the carrier aircraft is 40 percent complete. It also notes the company’s website consists of a single page with a photo of the aircraft being built and a message saying the website is under construction. The website was much more extensive in the past. 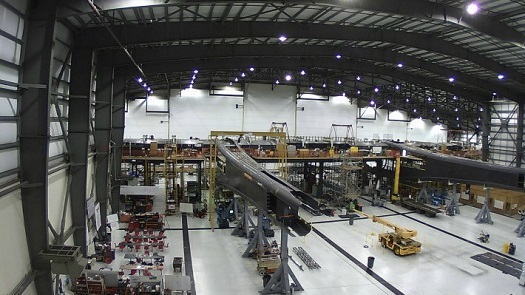 The aircraft is being fabricated and assembled at the Mojave Air and Space Port in California. The program employs a large work force from Scaled Composites and BAE Systems. The enormous size of the carrier aircraft — which will have a wingspan of 385 and be powered by six 747 engines — has spurred unflattering comparisons to Howard Hughes’ massive Spruce Goose, a giant cargo plane that flew only once. The Stratolaunch aircraft has been dubbed Carbon Goose and Birdzilla. I’ve had a Spruce Goose feeling about this bird since day one. At least it’ll make one hell of a museum piece one day. Yeah, but they’re gonna have to build a bigger museum. Will this be another Burt Rutan boondoggle? Say it ain’t so. Donate it to the Mojave Transportation Museum and just leave it in the hangar where it’s being built. Come to think of it, MTM is looking for a facility to house its collection. If the production facility next store becomes available…. There would only be one problem left to solve: getting people to come to Mojave to visit the museum. Building the vehicle before you figure out the rocket. Where have we heard that before? Too true and too sad. But I hope they come up off the mat swinging. Go Burt Go. Or…they could move it to Spaceport America. I hear that they have some space available. Maybe SS2 will end up next to it someday. (I hope not). One of my working group members mentioned that the BE-4 might just be suitable for a big honking liquid fueled primary air dropped stage, but just looking at the basic engineering for something like that is fairly mind boggling. They should just start small and launch anything. I think what they are doing is completely reevaluating the entire launch process and market, as I don’t think much is salvageable from this debacle. Lessons learned. Hopefully there will be some cash left over for either some liquid propulsion development or some kind of mix and match Lego vehicle development. Above all, he probably needs some unbiased scientific space cadet advice. Something diametrically opposite of what he got from Burt Rutan et al. Is there a museum over at the airport? Don’t seem to remember seeing it last time I was there. What’s in it that I missed? The fiberglass Roton is the only thing I remember seeing.. I don’t know. Horizontal air launched rockets offer no good trade off. If the launch platform was flying vertically and was reusable, it could be actually sensible.